We knew Huawei's new Mate 10 will start shipping in October, but now we have a specific date to mark on our calendars. 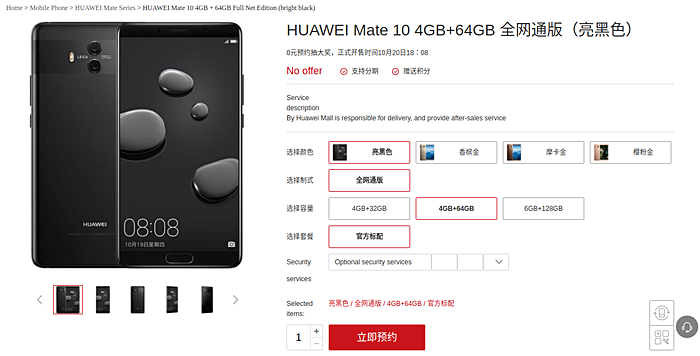 The device's listing on the company's official online store Vmall reveals that registrations for the phone are already live, and it will go on sale starting October 20, with China becoming the first market to get it. Interestingly, the listing also reveals two new variants for the Mate 10: one with 4GB/32GB memory, and the other with 6GB/128GB memory. At the unveiling, Huawei said the Mate 10 only comes in 4GB/64GB memory configuration, so it's possible that the other two are China-specific. Anyway, the October 20 event for the Mate 10 in China should also see the Mate 10 Pro as well as the Porsche Design variants being announced, but as the company has already confirmed, they'll only be available sometime next month. The listing mentions no pricing. In Europe the standard Mate 10 costs €700, while the Pro and Porsche Edition variants will set you back €800 and €1,400, respectively.